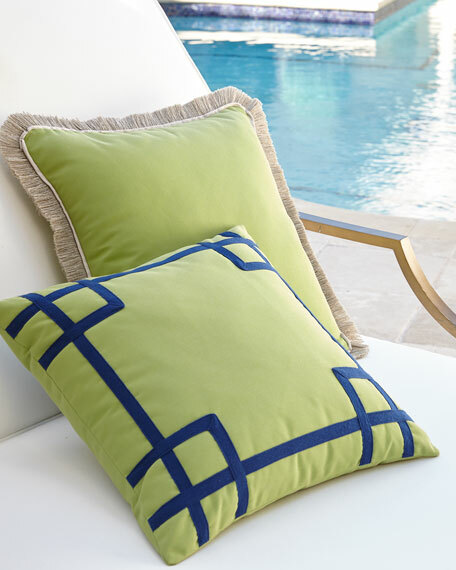 Green outdoor pillow with sand fringe. EXCLUSIVELY AT NEIMAN MARCUS Pillow with faux-silk diamond frame and back. Cord edge. Polyester/viscose. Dry clean. 20"Sq. Made in the USA of imported materials. Handcrafted pillow. Hand-painted Belgian linen front; silk dupioni reverse. 20"Sq. No two pillows are exactly alike. Hidden zipper. Feather/down insert. Handcrafted pillow. Hand-painted Belgian linen front; silk dupioni reverse. 20"Sq. No two pillows are exactly alike. Hidden zipper. Feather/down insert. Made in the USA. EXCLUSIVELY AT NEIMAN MARCUS Handcrafted pillow. Feather fill insert included. Cotton/polyester. 20"Sq. Dry clean. Made in the USA. Isabella Collection by Kathy Fielder Jaden Pillow, 18"Sq. Jacquard pillow. Main: polyester/rayon. Trim: polyester. Dry clean. 18"Sq. Made in the USA of imported materials.